The lovely locomotive lads opted for a shiny boat in their highest-charting song on this year’s countdown and washed up on a woman who tickled leader Pat Monahan‘s fancy. What can I say? It’s the classic buoy meets girl tale. Riding the tide of their successful 2012 California 37 album, this third radio single from it was co-written by Monahan and songwriting teams Espionage and Stargate, with Espionage and Butch Walker co-producing the track. In a bit of a twist, this song was actually on the airwaves during the winter months, although I guess it was a helpful reminder that summer would eventually show its face. Its rise up the charts was about average, climbing to #1 in its thirteenth week on and spending the first three weeks of March in the top spot. (I first wrote about it in November 2012.) I can’t say I’ve heard it in regular rotation on the radio since it was a current on the charts, though the song remains a fan favorite. “Mermaid” did very little outside of the States, and even in the U.S., it missed the Hot 100 by a few spots, peaking in the Bubbling Under. It did, however, become the band’s latest top 20 entry on the Hot Adult Contemporary survey, a streak that likely has a few more years left in it. After all, the band is still a hot touring act, Monahan has a popular weekly podcast and their music is still all over the place. This one may have gone overboard, but it wasn’t a total loss. 2013 was yet another great year for Train and I can’t wait to see what 2014 brings, including a new album due to be released in the third quarter. Stay tuned. They’ve been reggae and calypso and now they’re up to their third single from their compact disco. Ay dios mio. 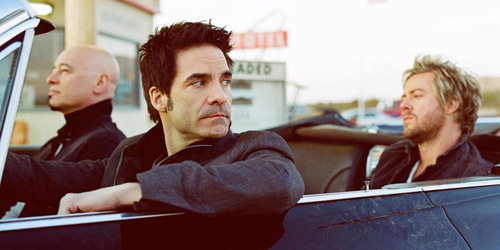 Train have been pretty consistent this era in providing some earworms that you can’t help but crank up on the stereo. In January, they unveiled the first single from California 37, a song entitled “Drive By”, and despite some cringeworthy lyrics (I’m looking at you, Hefty bags) it rose to a peak of #2 on the Hot Adult Contemporary chart, top 20 on CHR radio and spent a few weeks on top of my own personal chart. Just a few months ago, Train employed a mariachi band for about fifteen minutes to create “50 Ways To Say Goodbye”, which spent six weeks at #2 on my survey and, again, went top 5 Hot AC and top 20 CHR. I give that one brownie points for using Yom Kippur in the lyrics. The Jew Crew has to stick together, people. Plus, “I Gotta Feeling” with its auto-tuned “mazel tov” and “l’chaim” has been overplayed for years anyways. By the way, are there actually 50 ways to say goodbye? Can someone get Paul Simon on the line or is too late in the evening? There’s been some shifting around when it came to the third release from California 37. A few months ago, a music video blog reported that a clip “Bruises”, which features Country singer Ashley Monroe, was in production, so I automatically assumed that that was the choice. Several weeks passed and I then noticed that “This’ll Be My Year” was being released to radio in Australia. Hmmm. Well, “Bruises” ended up being a video-only single, and “This’ll Be My Year” is staying down under, and thus, we come to the official third single already at American radio stations: “Mermaid”. Listen to “Mermaid” on YouTube.